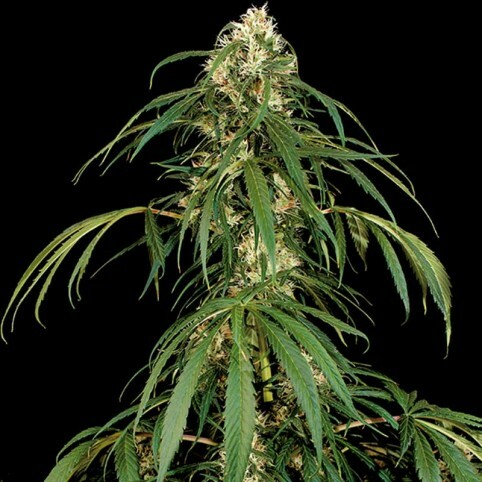 Super Silver cannabis seeds by Dinafem Seeds belong to a Sativa-dominant, feminized cannabis strain that originates from the cross of two Super Silvers. The result is a hybrid that will delight Sativa lovers. Super Silver cannabis seed was designed with the aim of creating a Sativa strain that stood out on its own. It is a wonderful, easy to grow, vigorous marijuana plant that flowers quite fast and produces dense, elongated buds covered in resin. It is suitable for growers of all levels, including those who are very quality conscious. Super Silver cannabis seed produces a slender plant that performs well indoors and that grows quite fast. Outdoors it reaches full potential in a dry, sunny climate or in the pleasant atmosphere of a greenhouse. Its quality crops make up for the quite long flowering period of some phenotypes. Super Silver cannabis strain has an intense flavour and aroma, with distinct hints of lemon, pine, cedar, incense and spices. The long-lasting effect is powerful, cerebral, invigorating and euphoria inducing.